by a bee humming the heart of a wildflower. 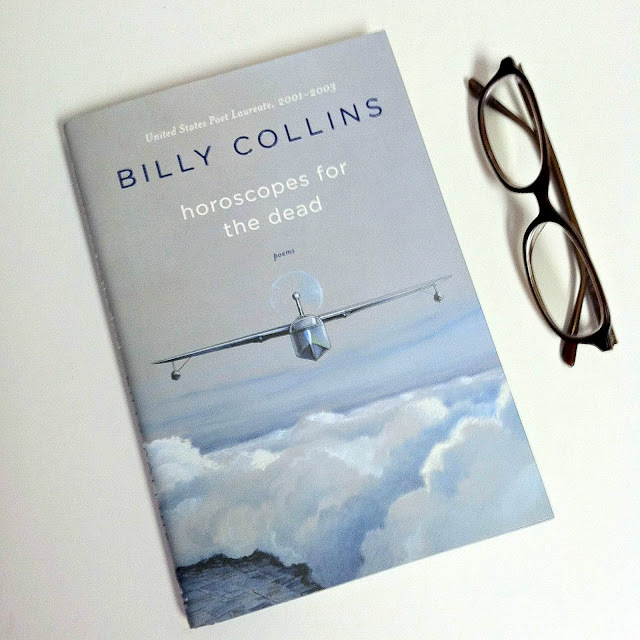 Billy Collins' accolades are well known: United States Poet Laureate from 2001 to 2003, New York State Poet Laureate from 2004-2006, distinguished professor, editor, and prolific poet. Though the volume Horoscopes for the Dead: Poems appeared a decade after his first appointment to his well-deserved position as U.S. Poet Laureate, it is clear to any poetry fan that Collins' work continues to give insight into the human condition. Divided into four parts, the collection features themes of memory, loss, hope, the past, and those we remember. Part of the brilliance of Collins' words is his ability to make his poetry seem effortless in execution, a sign that a true poet painstakingly crafted these prophetic verses. These poems beautifully shift from the comic to the profound and back again. Horoscopes begins with "Grave," a portrait of a young man standing before the graves of his parents asking them questions and then pressing his ear to the ground desperately trying to hear their answers. The fifty poems that follow are each amazingly unique: "Palermo" about a man imitating the movements of a squirrel; "Genesis" a musing about Adam's rib and the bodies of men and women; and "Hell" in which a couple shops for mattresses and feels as if they are reenacting passages from Dante's Inferno. It is difficult to chose a favorite though "Simple Arithmetic" (a man imagines what a place looked like long ago) and "The Chairs That No One Sits In" (what empty porch chairs say about their owners) are close contenders. Collins' gift for turns--both between poems and within them--is true artistry. "My Unborn Children" is unbelievably heavy, but it then immediately followed by a poem as clever and humorous as "Hangover," and then back to profound again with "Table Talk" and then "Delivery." "Feedback" (in which a fan praises and then belittles the poet) is hilarious, as are "Drawing You From Memory" (a loving husband poorly tries to sketch his wife's portrait only to be accused of drawing another woman) and "Riverside, California" (an intoxicated proposal to all three of Tina and Ike Turner's Ikettes). Even poems that might seem to tackle more light or trivial topics--"My Hero" praising the tortoise above the hare, and "The Meatball Department," a discussion of lost departments and husbands--are always deeply meaningful in their message. It is no surprise that the volume was a national bestseller, winner of Goodreads' Best Poetry award, and one of Newsweek's best books of the year. Collins' poetry is both approachable for a first-time reader of poetry and profound for a long-time poetry scholar.